November is a month now associated with the Poppy, a symbol of remembrance and appreciation of the sacrifices made by past generations, and in the last few years, our own contemporaries. A classic and simple design, the Poppy as a logo is instantly recognisable, as well as a way people can display their own appreciation of this military sacrifice for our own freedoms. 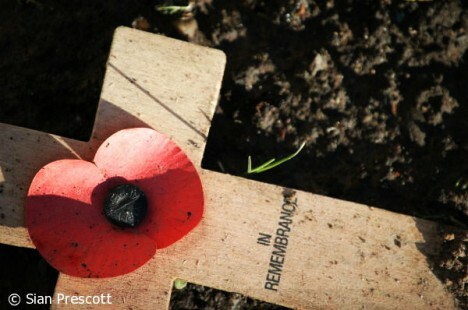 The Poppy Appeal has successfully used this flower as an effective iconic design of simple poignancy. Amidst the carnage and devastation of the battlefields of the First World War, the poppy flower was seen growing amongst no man’s land, and carved such an impression on the mind of a serving doctor, John McCrae, he wrote the famous poem: “In Flanders’ fields, the poppies blow…”. This poem inspired an American War secretary, Moina Michael, to start selling poppies, the proceeds going to the ex-Service community. And thus the Poppy Appeal charity through the British Legion was born. The first Poppy Day was in 1921, and has remained a tradition every November since. In 1922, Major George Howson, founder of the the Disabled Society (established to help disabled ex-Service men and women from the First World War), suggested to the Legion that members of the Disabled Society could make the artificial poppies sold for the charity. Subsequently, the original artificial poppy was designed so that disabled workers could manufacture it with ease, especially so that it could be made by a worker with only one hand. The simple design was, therefore, mostly born from a necessity of easy assembly. As with a lot of great iconic logos, less is more. The blood red is striking, and yet the Poppy’s soft edges portray a powerful message of beauty amongst the destruction – of life amongst the dead. And lest we forget. Thanks Amy. Now that is very interesting! And now you have mentioned it, I’ve just remembered that Scottish poppies are different to the ones you see in the rest of the UK – with four petals and no green leaf. I am not 100% sure why this is so but I seem to recall a claim that it cost £15K less to not have the green leaf (as well as being ‘botanically correct’). I just find it rather fascinating a symbol, and particularly the idea that it was designed with the idea of disabled workers assembling it. And of course, Amy, John McCrae was a Canadian!